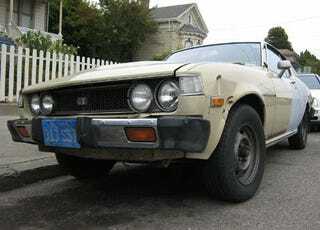 As we've already had a '77 Celica in this series, we're now looking at our first multi-DOTS car. But we have this entire island, with its 70,000 population and little off-street parking, and I can only find two early Celicas? You used to see two of them on every block! The Crusher probably fed exclusively on 70s Celicas for much of the mid-90s, as each one hit 200,000 miles and required some repair costing more than 50 bucks. And now Alameda is down to one somewhat straight blue '77 Celica and this much rougher beige one. Looks like someone got ambitious enough to do some Bondo work, applied some primer, and then gave up on the project after looking at all the other body damage. Toyota felt it was important that everyone know you were driving a Liftback, so they put this special emblem on the rear hatch. The whip component of the antenna is missing, but looks like we've got an authentic 70s survivor here, CB radio and all. Breaker, breaker! Sure, Toyota ripped off the look of late-60s fastback Fords. You got a problem with that? Hell, they should have stuck with that look for another 20 years!